Trillions of bacteria live in your body. Most are part of the gut microbiota, the helpful intestinal bacteria and yeasts that provide a variety of benefits -- destroying disease-causing bugs, aiding in food digestion, producing vitamins and strengthening your immune system. When harmful bacteria cause illness or infection, your doctor may prescribe an antibiotic to kill those bacteria. Unfortunately, antibiotics also destroy some of your beneficial gut bacteria. Taking probiotics -- health-promoting bacteria and yeasts -- during your course of antibiotics can replenish the good bacteria and help reduce some of the side effects of taking antibiotics, including diarrhea. Antibiotics can cause physical side effects such as gas, cramping, bloating and diarrhea. According to a October 2008 article published in “Future Microbiology,” antibiotic-associated diarrhea (AAD) occurs in 5 to 35 percent of antibiotic users, depending on the type of antibiotic used, the user’s health and exposure to illness-causing microorganisms. AAD is a significant problem, since it may cause people to stop treatment early, thus fail to treat the infection. In addition, AAD often increases the amount of medical care needed to treat the infection. According to a report in the April 2012 issue of “Alimentary Pharmacology and Therapeutics,” AAD is in part due to the effects antibiotics have on gut microorganisms. These medicines favor the growth of infection-causing bacteria, and cause changes to gut bacteria and the intestinal environment that hasten the movement of food through the gut and cause more fluid to be pulled into the gut -- all of which can contribute to diarrhea. Since probiotics are known to improved immunity and counter the effects of disease-causing bacteria, probiotics have been proposed as a strategy to prevent and treat AAD. The article published in “Alimentary Pharmacology and Therapeutics” analyzed the results of 34 studies, and concluded the use of probiotics during antibiotic therapy resulted in 50% lower risk of developing AAD compared to those taking placebo. These results were found in the pediatric and adult population -- and the results were consistent with the use of various strains of probiotics, as well as with different antibiotics. Therefore, research to date concludes the most significant benefit of using probiotics when taking antibiotics is a reduced risk of AAD. Many women report an increase in yeast infections when taking antibiotics. This may be due to an overgrowth of Candida albicans -- an opportunistic yeast that can grow out of control when antibiotics kill some of the beneficial bacteria that normally prevent a candida overgrowth. However, a review published in the June 2009 “Journal of Chemotherapy” did not find any clear benefit of using probiotics to treat or prevent candidiasis infection in women. 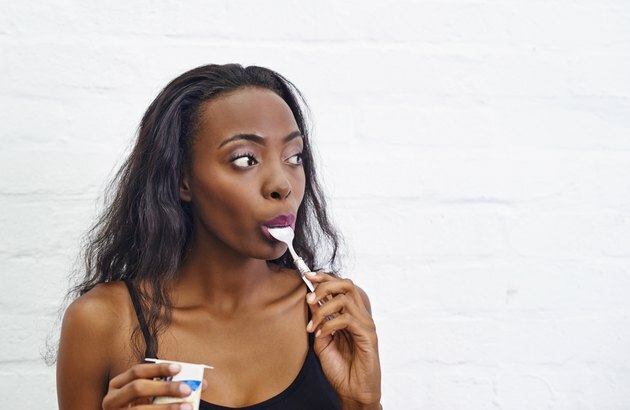 Unless you have milk allergy or intolerance, adding probiotic-rich yogurt, kefir or a similar probiotic-rich food to your daily diet while taking antibiotics may be an easy and effective way to prevent AAD. If you plan to use probiotic supplements along with antibiotics, discuss dosing and timing with your doctor or a pharmacist. Probiotics can cause side effects such as cramping, bloating, gas or diarrhea, however most people tolerate probiotics without side effects. However, probiotics have the potential to lead to infections in people with underdeveloped or weakened immune systems, such as the elderly or infants. So, it's wise to consult your doctor about risks and benefits before starting probiotic supplements. Future Microbiology: Antibiotic-Associated Diarrhea: Epidemiology, Trends and Treatment. The American Journal of Clinical Nutrition: Protection From Gastrointestinal Diseases With the Use of Probiotics. Journal of Chemotherapy: The Role of Lactobacillus Probiotics in the Treatment or Prevention of Urogenital Infections--A Systematic Review.